Think of a teacher made of plastic and computer circuits! It is a reality, at least in Korea. It is a fact that nowadays ‘Endhirans’ ie, robot teachers invade South Korean classrooms. This isn't a sci-fi movie. Engkey is an example. It is a robot teacher teaching English language in the coastal city of Masan in South Korea. Part of a pilot program launched by the South Korean government, students in two elementary schools in the city are being taught English by robot teachers. In high-tech South Korea, robots serve a variety of educational purposes and the government is pressing ahead with plans to expand its robot learning, or "R-learning," program. Mun-Taek Choi is a senior research engineer at the Korea Institute of Science and Technology, the government-funded research institute that developed the Engkey. Recent reports say that "the educational robot system indeed helps increase students' interest and self-motivation in studying English and improves their English skills." Thirty-six Engkeys are due to be implemented in 18 elementary schools across the Korean city of Daegu by the end of this year, according to KIST. The Engkey is linked to and controlled remotely by a human teacher outside the classroom, whose face appears on the screen of the robot. The robot links students to teachers located as far away as Australia. 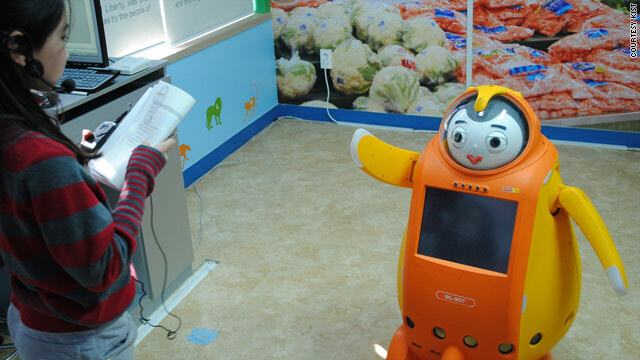 Besides being popular with children, the telepresence robot also helps address South Korea's shortage of qualified native-English speaking teachers. Robots haven't replaced human teachers in South Korean classrooms. Instead, they currently serve more as assistants. Another version of the Engkey, which doesn't connect students to a human, uses voice recognition technology to help students practice their English pronunciation and dialogue. Robots are a cost-effective way to help teachers when relatively simple and repetitive training is required. The Engkey isn't the only type of robot being used in schools. 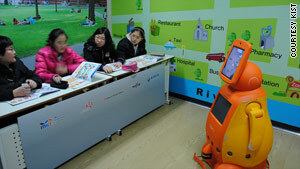 Pre-school teachers in the city of Daejeon have received a helping hand, thanks to iRobi and a robot dog named Genibo. iRobi marks students' attendance and uses a face recognition program to ask children about their mood. Genibo, originally invented to be a pet robot, was redesigned to teach dance and gymnastics moves. South Korea aims to introduce 830 of these types of robots into pre-schools by the end of this year, and its goal is to have them in kindergartens nationwide by 2013. But some experts are of opinion that if children are looked after by robots for too long, in almost exclusive care, it would give them attachment disorders. There is no understanding in robots, there is just processing.